When buying a new car many of us just turn our brains off once the dealer starts talking, which means potentially missing the little add-on options that drive the price up. Jalopnik readers picked out the ten most useless optional extras that are just there to fleece you of your cash. Why it's a ripoff: Race cars have their tires filled with nitrogen, so that means it's better right? Reader SuperfastMatt gives us a lesson in how to face the hype. Dude: "It's a standard charge with every vehicle we sell, it's very safe, the nitrogen doesn't..."
Me: "I'm a professional racecar engineer, I know why they put nitrogen in the tires. I also have a nitrogen tank at home which i purchased for less than $250." Dude: "As you drive, the temperature changes and so the pressure..."
Me: "I'll be sure and put nitrogen in the racing tires, or if i plan on landing my MINI on a aircraft carrier." Dude: "the molecules are smaller and so th..."
Me: "The difference is so negligible in the real world tha.... you know, it's just easier for me to order the car from someone else." A lot of cars come with 17" already, but then they try to charge you $1,000 for the 18" option. Think about this. They're saying the additional inch of rim (which usually adds maybe $100-$200 to the 4-rim price in the aftermarket, plus maybe $50 more for the tires) is going to be another $1,000. I think it fools people because they think of it as "only $1,000 for some 18" rims" instead of "an EXTRA $1,000 for some 18" rims." For the love of all that's unique and personalized, please purchase your wheels and tires from somewhere like Tire Rack. You'll save money, won't look like every other douche, and when you want to sell the car, you'll have a mint condition set of "take-offs" sitting in your garage to make your car look brand new again. Why it's a ripoff: Rustproofing is one of those things that you don't really understand, so you end up paying too much for it despite any good intentions. You don't want your car to rust, right? 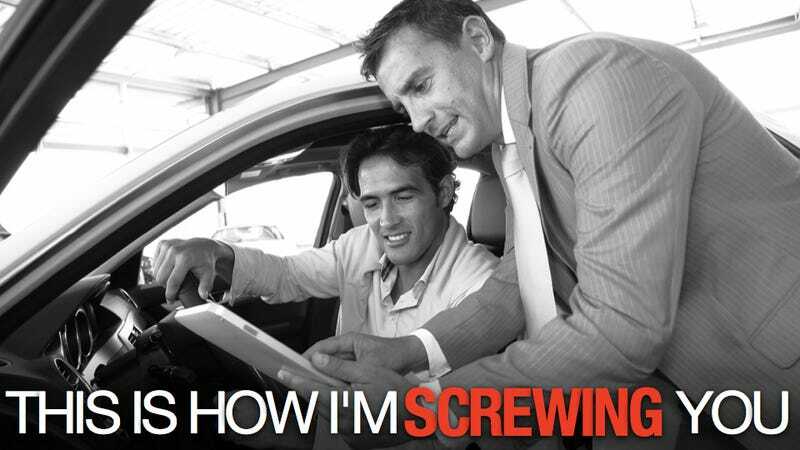 Reader lonestranger goes into how things work from the dealer's perspective. I used to work at a detail shop. We sold rustproofing to customers off the street for (if I recall correctly) $129, rubberized undercoating for $189, or the pair for $299. We provided the same services to some of the smaller dealers in town that didn't have their own equipment. The dealers charged $500-$600 for the pair. The customer was usually happy, though, since they could roll the cost into their financing, only adding a few bucks a month. Either way, most late-model unibody vehicles I saw already had a rubberized coating on the floorpan and wheelwells, so that was basically a waste either way. Why it's a ripoff: We don't really understand why the spare is an optional extra. People need spares. They should be standard features, not new ways to plug every new car with a few hundred more bucks. Why it's a ripoff: The great audacity of those little accent pinstripes put on by car dealers isn't the hundreds of dollars they charge you for putting them on the car (something you never wanted in the first place), the real travesty is that they charge you to have them removed. Why it's a ripoff: Dealers like to pretend they're Don Yenko and stick on some tacky plastic cladding as if they've created the best thing since sliced bread. No, you just pre-riced your cars and you're trying to fleece some sucker to drop a few thousand on the whole mistake. Why it's a ripoff: There is a stunning ambiguity to the listed expense of "dealer prep." It's not hard to find an extra few hundred tacked onto the price of a new car with slightly shinier tires, but it's hard to find any real justification for that new price. Why it's a ripoff: At a glance, the Porsche business model seems to revolve around selling the exact same car for about eternity. In fact, they spend much more effort in concocting ways to make you pay more for what is basically a stock car. Our favorite instance might be the hundreds of dollars they charge to paint your key to match the car itself, but the most obviously egregious option is the few hundred backs it'll set you back to get the little Porsche logo in the center of your wheel painted. Suggested By: I Can Be Stig? Why it's a ripoff: Combining the ambiguity of "dealer prep" with the infuriating uselessness of pinstripes, dealer packages are a perfect way to fleece buyers of their money. Photo Credit: I Can Be Stig? Why it's a ripoff: We're not here to argue that Ferrari's stitched leather seats aren't gorgeous. What we're here to say is that even if the exorbitant cost of changing the stitching color on the inside of your Ferrari is less than you spent buying a new hood for your trained falcon, it's still a shameless grab at your pocketbook.